Updated Feb. 16 at 2:43 p.m. Eastern with the correct launch timeframe for Capella Space’s first spacecraft. MOUNTAIN VIEW, California — Planet and Spire, operators of the two largest commercial cubesat constellations in orbit, say they manage their fleets to prevent retired spacecraft from lingering in space beyond internationally accepted guidelines. 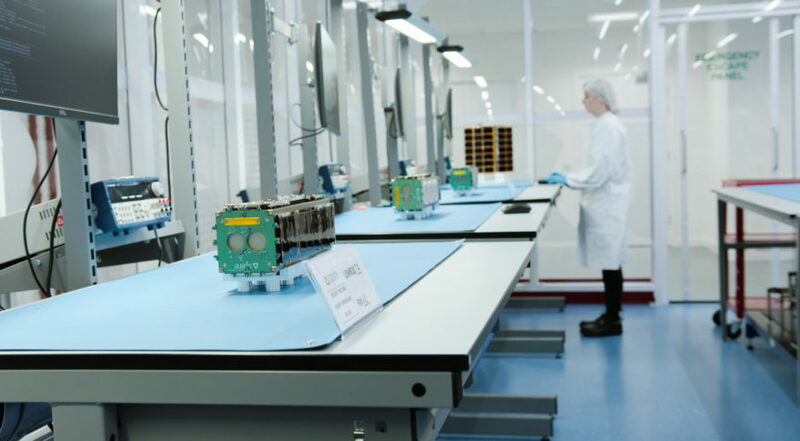 Earth-observation company Planet has 200 satellites in low Earth orbit, making its imaging system of five RapidEye smallsats, 13 SkySat smallsats and 182 dove cubesats the largest constellation in orbit. Commercial weather, ship tracking and soon-to-be flight tracking company Spire has 58 Lemur cubesats in orbit. Mike Safyan, Planet’s senior director of launch and global ground station networks, said the company aims for 500-kilometer orbits for its satellites and has a limit on how far above that altitude it will go. Staying at that low altitude “guarantees that we are decaying on the order of five years maximum, maybe 10,” he said. Jenny Barna, Spire’s director of launch, said every license Spire applies for with the U.S. Federal Communications Commission includes an orbital debris assessment stating that even if the company’s cubesats were dead-on-arrival from the moment of launch, they would still deorbit within the IADC guideline. “We will definitely be down from launch to completely burned up in under the 25-year rule. It’s passively the default system of our cubesats,” she said. Safyan suggested that the problem of smallsats-turned-space-debris in LEO will likely “be a self-correcting problem” as the launch industry brings to market vehicles and adaptors specialized for such spacecraft. Once more dedicated launchers are available, companies and organizations scraping around for a means to space will have more options, he said, and won’t have to take missions that place them at altitudes where, without onboard deorbit systems, they will become space junk. Mega-constellations of telecommunications satellites, many of which have proposed larger numbers of spacecraft at higher altitudes, are a different story, he said. U.S. and New Zealand company Rocket Lab’s successful Electron launch in January could be the start of regular launch opportunities for small satellites. Daniel Gillies, Rocket Lab’s mission management and integration director, said on a Feb. 6 panel that the company’s third launch will be in the next few months, and that a launch cadence of once a month is the goal by the end of the year. Virgin Orbit also expects to begin flights with the air-launched LauncherOne dedicated smallsat vehicle this year, and to scale to twice-monthly launches by 2020. The U.S. National Defense Authorization Act of 2018 could reduce launch options if a rule that bans doing business with the U.S. government using satellites launched on Russian rockets is implemented. That rule, which disincentivizes Russian Soyuz, Proton and Angara launch vehicles, goes into action in 2020. Barna said the rule would mean companies, if they want to continue using Russian rockets and doing business with the U.S. government, would somehow have to parse data out to avoid using any that came from Russian-launched spacecraft. “They are not thinking through the complications of this; they are just assuming that people won’t launch from Russia after this comes out,” she said. Safyan said while he isn’t worried about the rule given the rising number of new launch entrants, the U.S. government might be willing to discuss the implications of the bill, and possibly create exceptions, like what is done for India’s Polar Satellite Launch Vehicle (PSLV). The U.S. prohibits launching American satellites on PSLV, but regularly issues waivers because of the lack of alternative domestic vehicles. Barna said this was the case last year when the U.S. Federal Aviation Administration kicked Spire off of a government Minotaur-4 mission. Those satellites were re-manifested on a PSLV, she said. Capella Space and Blacksky, two remote-sensing operators that have yet to launch spacecraft, say their constellations of 36 and 60 satellites, respectively, will also adhere to the 25-year guideline. Payam Banazadeh, Capella Space CEO and co-founder, said his company’s constellation of synthetic aperture radar (SAR) satellites will orbit between 450 and 520 kilometers, and are designed to last three years. The large antennas required for SAR imaging act as the equivalent of “a giant sail,” he said, meaning even if on-board propulsion were to fail, atmospheric drag would pull them down in short order. Capella Space is targeting 2018 for launching its first two spacecraft. Banazadeh didn’t detail launch arrangements, but said the U.S. National Geospatial-Intelligence Agency is among the top early customers the company anticipates, meaning the defense bill will likely have a major impact on rocket choice. Jason Andrews, president and CEO of Blacksky, said his company’s satellites would deorbit “within three or four months” from their 450-kilometer operating altitude without an active deorbit system. He said Spaceflight Industries, owner of Blacksky and the rideshare-organizer Spaceflight, also follows the 25-year guideline for its launch infrastructure. Spaceflight’s Sherpa payload adapter and SSO-A Falcon 9 mission have drag devices equipped to ensure a deorbit would occur even if payloads fail to deploy, he said.